The idea was to represent with an interactive behaviour the beauty of literature. Some selected text about literature written by famous people were projected in a 120" display. When the public walked in front of the screen the letters of the text waved like moved by the wake. 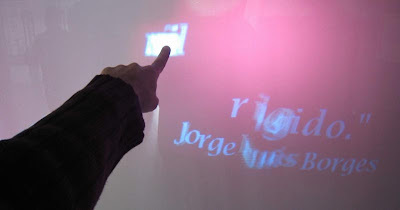 Then, if the user decides to touch the screen, the letters suddenly move to the fingers as atracted to magnets. We used the CCV multitouch detection software developed with openFrameworks and we made the client application with Processing.